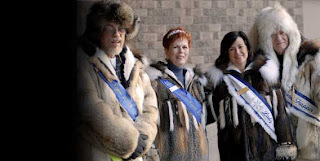 The Pioneers of Alaska choose the King and Queen Regents for Fur Rendezvous, and pictured above is the royalty from two years ago. The queen has been chosen, and I will post her image when I get a shot at her. Our weather is really mild compared to the Eastern states this winter, and we've been blessed with a heap of snow for our Fur Rendezvous events. This event was originally set up to help us thru the winter, to prevent cabin fever, and sell fur pelts. However, it's changed over the years, until now they have replaced the big Monte Carlo Night with a Poker Turnament. This took lots of bargaining with state lottery laws. Also, the dog-sled races from Fourth Avenue lack any local hero, and takes second place to the Iditarod Races which follow the following week. It all opens with a big parade and fireworks display, and the list of events can be found online if you search Fur Rendezvous, as I am only writing the things that interest me. this would be the Pancake Feed, with the men Pioneers doing the cookin', and the women doing the rest of the work. The Miners and Trappers Ball continue to draw the masses with great costuming, and the Figure Skating Club puts on a wonderful show at the University Ice Rink. The Senior Center has Pioneer Stories from the long-timers together with a gourmet meal, and they have cribbage tournament, art show, etc. The melodrama also draws a sold-out crowd nightly, and the magic circle does a show at the library theatre. At the same time, our eyes are on our local athletes and others representing USA at the Olympics. 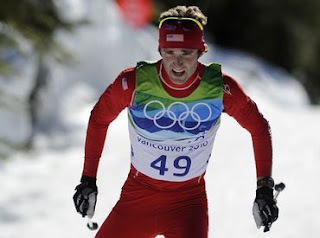 Pictured here is James Southam, who is entered in the cross country ski race. Our more publicized female in the race is Kikkan Randall, and sorry to say they didn't get any medals. However, we're proud of the many winners from our country. We are also blessed with being able to watch the Olympics at more reasonable hours than the Eastern states. 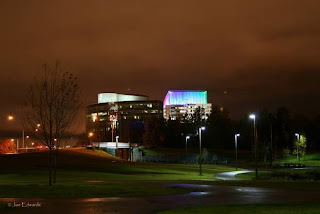 It is quite overwhelming, but is taking a back burner to our Anchorage events. I should mention that we more going on than just the Fur Rondy, as the Iron Dog races are on, too, somewhere up north of here. So there's lots of reasons to visit Alaska, and don't forget to get your Travel Insurance which you can read why buy, then apply! Online or call for help. On the downside of winter, things are oh, so busy, in Anchorage. The city has Fur Rendezvous competing with the Winter Olympics (on TV) for our attention. The coronation of the King and Queen Regent takes place first, followed by the queen and her court, the Reindeer Run, the Dogsled Races starting on Fourth Avenue, and of course, the big parade. With all the activities, sadness also has taken two of our well-known citizens. First, we were sorry to lose Betti Cuddy, whose beautiful park was donated to the city, about two years ago, hidden behind the library in mid-town. It has a beautiful pond, and they even created a speed skating track for the athletes to practice their sport-of choice. A real jewel, and Betti leaves a wonderful family to carry on her community services. Second, an avalanche took the life of the president of Alaska Conoco-Phillips and a companion he was snow-machining with in the beautiful mountains on the Kenai Peninsula. This oil company is the successor to Arco, who has been very generous in donating to the arts, and other non-profits in Alaska. Our weather is mild, and we watch the weather reports of the Eastern states, and mid-West. What a horrible time they're going thru. I had to smile at the report that our congressional delegates reported for work-as-usual in Washington D.C., as it didn't seem that different from home. I guess they didn't stay the day. This just confirms what I've been saying . . . Alaska is a super-duper place to live!